I had three days to get after a project I am working on for Telemark Skier Magazine about Utah's Ogden Valley. My flight to Japan was fast approaching, I was way behind on getting ready, and my Dad and brother were flying in to Salt Lake City in order to hang out for a few days before I left. Needless to say I had a lot to attend to when you throw in my night job as well. Just a day in the life this time of year though. Kjell Ellefson, was coming into town to shoot the photos for the project and we only had three days to make something come together. ^I set up an early morning rendezvous at Snowbasin for day one. I had scheduled two days to get some shots there, and the conditions were going to be tough. 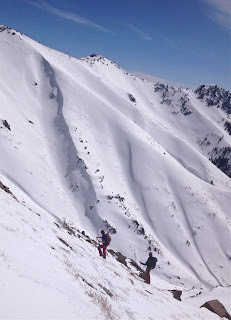 We had received a lot of wind, and I was worried about windslabs up in the higher elevations. Sunrise on the peaks was a good start to the effort. ^In typical Snowbasin style though, we prevailed. I had a great crew that included Kjell, myself, Matt Shortland, Loren Griswold on day one, and Andrew Schauer on day two. 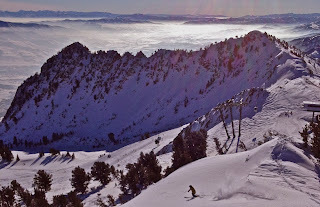 In the photo above, Matt, is making a big fast swooper turn with a glorious looking inversion setting in behind Snowbasin's Sister Chutes. After two days we had enough in the bag to be able to feel good about this aspect of the project. We will still need to shoot some more, but we at least have a good start. ^It is easy to smile on the drive home after two days of getting after it with some success. This project still has a lot left to wrap it up, but a good start is comforting. A view like this on the drive home doesn't hurt the spirit either. ^A good day in the mountains must be served with a hard nights work in the bucket. Deicing airplanes suits me because it runs in lock step with the winter state of mind I reside in this time of year. The deicers are the only other folks I know outside the ski world that pay as much attention to storm cycles and the intricacies of precipitation. They don't look at me like I am speaking spanish when I start going off on the factors that accelerate the faceting process. They know that frosty wings are created by the same factors. ^On day three of the shoot we traveled over to Powder Mountain. 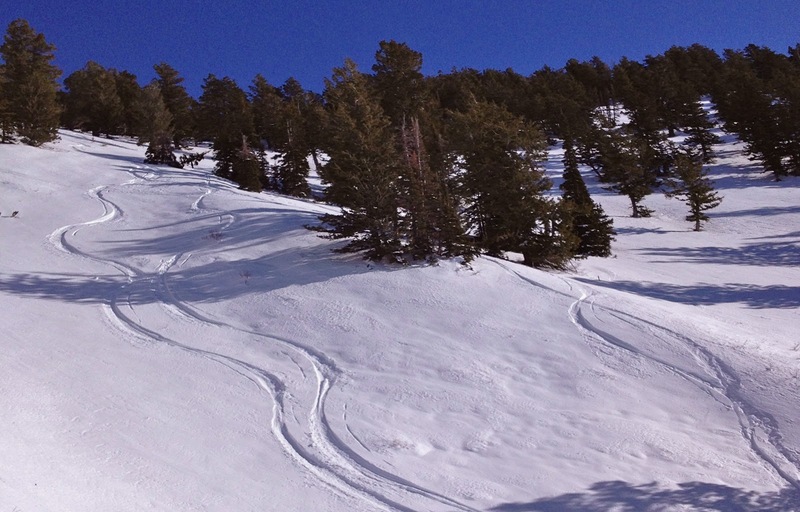 These tracks in the morning came via the Adventure Center at Powder Mountain. Chad Hart runs the program at the Adventure Center. What a fantastic program it is too. Powder Mountain offers up the guided backcountry experience to all levels of snow riders with Snowcat Powder Safari tours, Single Ride Cat Skiing, and Guided Inbounds and Backcountry tours. From the die hard touring monster to the weekend warrior, there is something for everyone to get their powder fix. I had a four-man crew with myself, Kjell, Andrew and local Ben Geiger. We scored these glorious tracks shown above in Powder's guided skin and ski terrain. Our guides, Brian Pollick, and Chad loaded us into the Lightning Ridge single ride cat and took us out for these goods. A short skin back to the ridge, and we rallied another lap before lunch. ^Chad treated us to some delicious burgers for lunch in the Powder Keg, and we talked over the afternoon plan. He arranged the Powder Safari cat to load us up at the top of the Hidden Lake chairlift. The afternoon would be the grand tour of the vast accessible acreage of endless powder. Powder Mountain never ceases to amaze me when I get a clear day to see all of the skiable acreage they have. It is just so vast, and so fresh. Rolling around in the cat skiing terrain brought it home even more to me just how much terrain there is at Powder Mountain. Now with the Adventure Center backcountry program they are finally able to properly offer all of it to the people. ^Chad capped off our day in perfect fashion with a "Sunset Safari" cat tour. Right after we skied some clean powder through Mary's Bowl the cat picked us up, and rolled us up to an amazing overlook. As the sun began to set on our day we were all high fives at the views. Each of us were snapping Instagram photos to brag to our friends that we were finishing out a day of untracked guided cat skiing with the best kind of sunset over high alpine terrain. As the cat rolled to deliver us back to the real world in the glow of the sunset and high spirits, we passed more and more untracked acreage. After all, it is called Powder Mountain for a reason. I could not have asked for a better finish to a three day shoot that was put together in crunch time fashion. Kjell was shortly off to Sweden, and Ben and I were heading to Japan. Time was short, but the Ogden Valley Wasatch provided. As usual.